The "Tirpitz", 52,900 t, was in her time the largest and most up-to-date battleship in the world (apart from her sister ship the "Bismarck"). 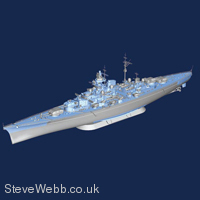 This 251 m long ship was launched on 1st April 1939 from the naval shipyards in Wilhelmshaven. but due to improvements and modifications had extensive technical and constructional differences from the sister ship. The newly designed heavy artillery shot projectiles weighting 800 kg up to a range of 36.2 km and could penetrate 350 mm armour at up to 21 km. After her first use in combat as the flagship of the Baltic Fleet in July 1941, in January 1942 she was moved to Norway in order to prevent an expected British invasion. From floating bases in the fjords she operated against British convoys carrying war supplies to the Soviet Union. But from September 1942 the Tirpitz was no longer operational due to substantial damage caused by an attack by 3 British mini-submarines of the X class. 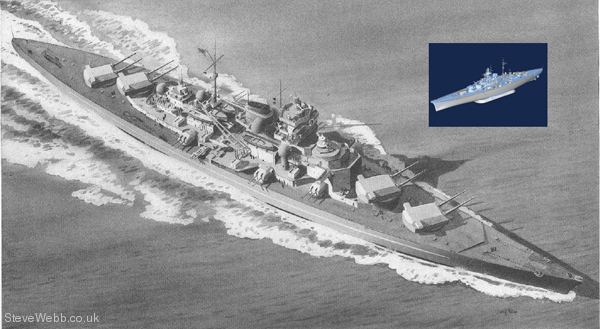 The Tirpitz was not seaworthy until March 1944. From April 1944 further damage was caused by numerous British air attacks, so that the Tirpitz was retired from service as a floating battery. Further British air attacks followed until finally, on 12th November 1944, the Tirpitz suffered 2 direct hits in an attack by 29 British bombers with heavy "Tallboy" bombs, following which she capsized between the islands of Haakoy and Grindoy - 890 men out of the crew of 2,608 survived.